Our online HAZMAT Technician Level III Responder course is designed to help workers meet the OSHA HAZWOPER requirement 29 CFR 1910.120(q)(6)(iii). Annual refresher training is required. This online course is for workers with refreshed, adequate, verifiable FRO training completed within the last year. Additional HAZMAT Technician course options available. This course is provided 100% online as a fully narrated class, combining audio and visual elements, and may be completed over time in sections. Our online HAZMAT Technician Level III Responder course is designed to help Hazardous Materials Technicians meet the OSHA HAZWOPER requirement of 24 hours of training per 29 CFR 1910.120(q)(6)(iii). Per OSHA, annual refresher training is required with sufficient content and duration to maintain competencies. This version of the course is for workers with refreshed, adequate, verifiable FRO training completed within the last year. Other available course options are listed below. 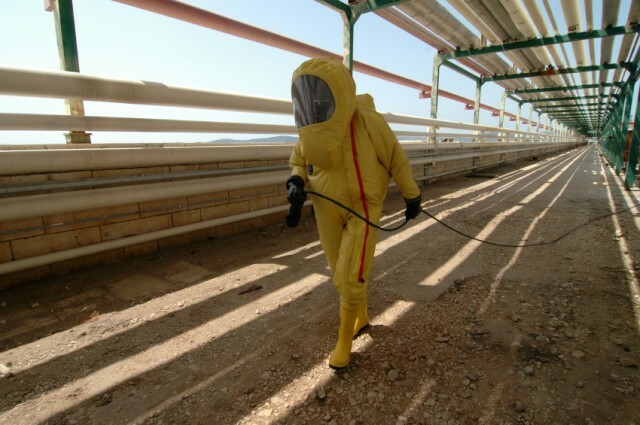 Why Choose HAZMAT Student for this Training? Animations showing an entire HAZMAT emergency from incident notification to termination. Video Demonstrations (50 short video clips) which show HAZMAT Response equipment in great detail, as if the student were attending our 8 Hour Hands-on Training. Online Tabletop Exercise which allows students to interactively simulate the role of a HazMat Technician, and play their role in a simulated emergency response. This course is offered 100% online through our premier Online Training System (OTS). The training is fully narrated, self-paced and available 24/7. Designed by Certified Outreach Trainers, this course includes up-to-date, high quality training created with your safety and learning as our top priority. The course features interactive training modules, which combine audio and visual elements for maximum retention. The course is completed entirely online using a computer with an internet connection and is available 24/7. For your convenience, it can be completed over time, and your progress will be saved to the last section completed. Students are given 6 months to complete the course after enrollment. We are so certain you will be satisfied with your experience, that we offer a 100% Money Back Guarantee*. Once the course is completed, you will immediately be able to download, save or print your Course Completion Certificate which is provided in PDF format. Within 24 hours of course completion, you will also be mailed a PVC credit card style Wallet ID Card, with optional photo, showing training course completion. Please note that this online HAZMAT Tech training class provides valuable training information which applies to a general population of employees who work in HAZMAT teams, Spill Response teams or Emergency Response teams. This course is not meant to replace company-specific or function-specific training provided by your employer on equipment use and procedures for your particular work environment. You must be trained by your employer on the hazards, equipment, engineering and administrative controls, safe work practices, policies and procedures and emergency plans specific to your role and workplace. OSHA requires workers to have adequate training of specialized equipment before use in a hazardous work environment. Regardless of whether online or classroom training is chosen, students should complete equipment training with the actual equipment used in their workplace and role. Our 24 Hour HAZMAT Technician course consists of three parts. In this course option, Part 1 has been previously completed by the student with adequate, verifiable documentation, and refreshed within the last year. Part 2 and 3 are completed online through our Online Training System (OTS) and consist of the individual modules and sections as shown below. The course may be completed over time in sections and course progress will be saved. This course includes exams which must be taken at the completion of most of the modules. Our online 24 Hour HAZMAT Technician Level III Responder course was designed by OSHA Certified Outreach Trainers. It is OSHA accepted and meets the requirements for 29 CFR 1910.120(q)(6)(iii).